Happy Friday! I've always been fascinated by the opportunity to create multiple exposures and in-camera image overlays. It's like magic how it works, and one of the perks of shooting Nikon. No Photoshop needed. Having two exposures blended into one in the camera, the image now tells twice the story. It has more depth, dimension and drama than a single image, and the resultant combined photograph is a bit surreal. 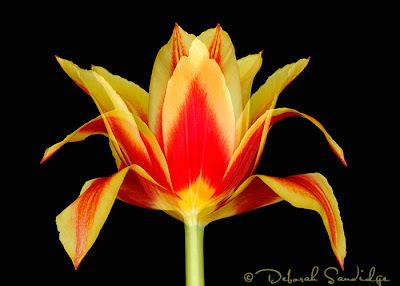 Here, I positioned my tulip in front of a black background. I made a variety of exposures, and selected two that would work together as an image overlay.